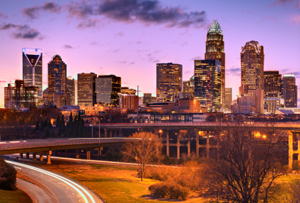 Lennar has begun construction on a new apartment complex located in midtown Charlotte. The new mixed-use development will feature 261 units and approximately 7,700 square feet of retail space. Lennar Multifamily Investors, the apartment division of Lennar Corporation, is constructing the new complex on South Kings Drive across from the Metropolitan development. The 2.5-acre site, which is bounded by South Kings Drive, Charlottetown Avenue, Cherry Street and East Third Street, was purchased last year for $8.25 million. The complex will wrap around a five-story parking deck and feature five levels of residential living along the East Third Street side. On the Charlottetown Avenue side, there will be six levels with the bottom level consisting of retail shops. With its location near uptown, two major hospitals and the Metropolitan, Lennar is gearing the floor plans in the complex towards the expected market. One bedroom and studio units will make up 70 percent of the apartments in the new, as-yet unnamed building. “We think having a grocery and a variety of dining and shopping across the street is one of the most exciting things about the location,” says John Gray, director of Lennar Multifamily Investors in Charlotte. The luxury apartments will include granite countertops and stainless steel appliances, and the outstanding amenities that will be available to residents will consist of a pool, yoga room, fitness center, spin room, dog spa and a coffee-shop area for residents who work from home. The first units in the new complex are expected to be delivered in the fourth quarter of 2014. This entry was posted in Charlotte new homes, North Carolina and tagged Charlotte, Charlotte real estate news on October 2, 2013 by Carol Morgan.